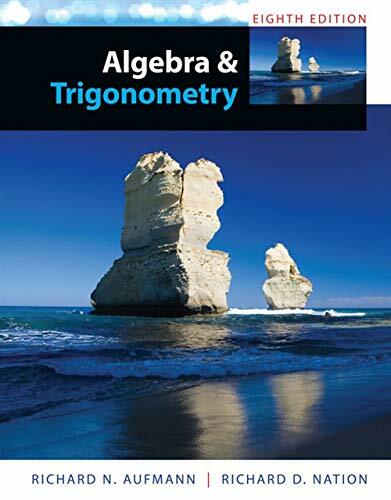 Author(s) Richard N. Aufmann Nation, Richard D.
Accessible to students and flexible for instructors, COLLEGE ALGEBRA AND TRIGONOMETRY, Eight Edition, incorporates the dynamic link between concepts and applications to bring mathematics to life. By integrating interactive learning techniques, the Aufmann team helps students to better understand concepts, work independently, and obtain greater mathematical fluency. The text also includes technology features to accommodate courses that allow the option of using graphing calculators. The authors' proven Aufmann Interactive Method allows students to try a skill as it is presented in example form. This interaction between the examples and Try Exercises serves as a checkpoint to students as they read the textbook, do their homework, or study a section. In the eighth edition, Review Notes are featured more prominently throughout the text to help students recognize the key prerequisite skills needed to understand new concepts.